Don't Get Mad. Get a Camera! She can't leave her books alone. Every day or two, I try to put all of her books in a nice neat row next to her nightstand. She must not like them looking straight, because she bee-lines it to them every time she sees them put away, and she throws them all over the floor (gently). 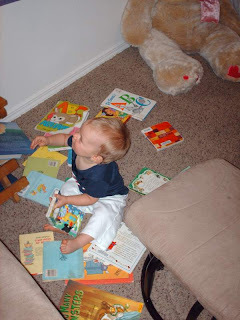 So, I finally took a picture of her playing with her books. So far, we've only had one ripped cover. Not too bad for an entire year!!! Lexi's favorite place to play is my bathroom cupboard. 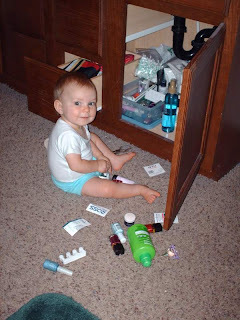 She loves getting out my hairsprays, lotions, nail polishes, make-up, etc. I actually use this to my advantage. If I am not lucky enough to get a shower in while she's napping, I can set her in the bathroom while I shower, and she just plays with my cupboard and takes everything out of my drawers. (This was at the beginning of her play, so she hasn't gotten everything out yet). Gotta love it! Lexi had a good nap, and had woken up happy. Started playing by herself in her crib, which is a good thing. Tells me she has napped long enough. I was on the computer for some reason, so I let her keep playing for a few minutes. I realized it was a little too quiet. (Any time Lexi is playing silently, I know she's into something she shouldn't be. Or has eaten something she shouldn't.) 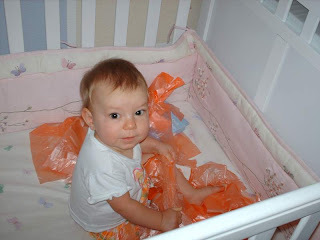 So, I walked into her room, and lo and behold, there she is, quietly pulling all of the diaper disposal bags out of the box! So, I grabbed a camera! 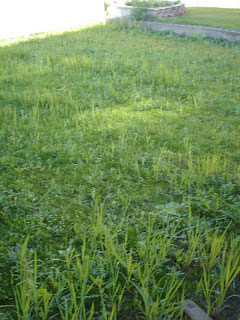 Well, after being in our house for almost two years, we have finally arrived...We finally have green on our yard! It's been a full two-year project. Jacob dug all of the trenches all by himself. Just him and a pick axe and a shovel. Since he'd just work on it here and there after work or for a bit on Saturdays, it took a while to do it. We had our yard trenched early on. 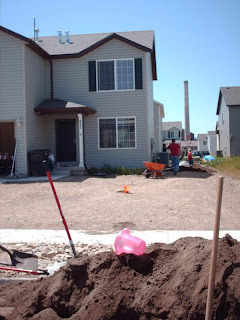 Then went through several months with hills and trenches all over the yard. Then, last fall, Jacob got all of the sprinkler parts, and laid all of the pipe himself. I helped a tiny bit. I mean TINY. Then, Jacob covered all the trenches up - I helped another tiny bit. 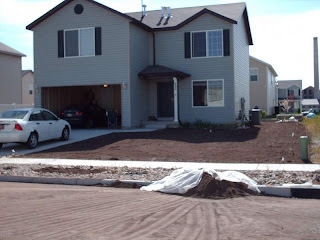 Then, this spring, we pulled a KAZILLION weeds, and raked TWO KAZILLION rocks. Jacob got the sprinkler heads on, and the system programmed. 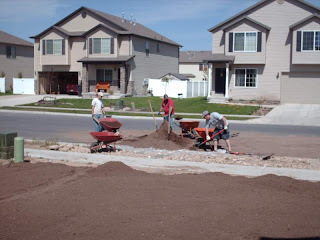 Then, some awesome neighbors, and one awesome sibling came over and helped us spread our top soil. And we seeded in May. Here are some pictures of the top soil party. Since May, we've just been waiting patiently for our grass seed to grow. Right now, the lawn is green! Wahoo! Unfortunately, it's probably more weeds than grass. We've heard conflicting advice on when to do the weed and feed stuff. Some people say not to do the weed and feed yet, but to do some weed-be-gone stuff. However, we also hear that in the heat of the summer, it can burn the grass. So, we don't know what to do yet. 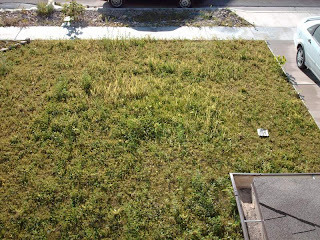 Eventually, the winter cold will kill the weeds and the grass will flourish. Hopefully. Well, since Alexia is almost a year old now, I figure I better update things from her 9th, 10th and 11th months before she turns a year old! Shame on me for being such a slacker. And sorry this post is SO LONG!!! 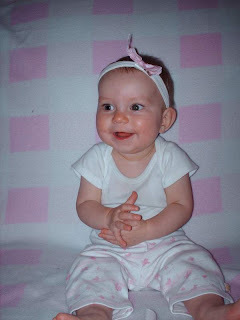 Here she is at nine months. Notice the slobber all over her onesie. 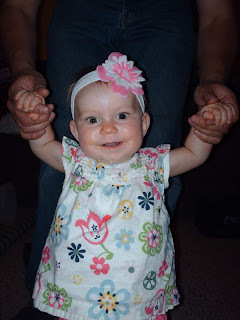 At her 9 month appointment, Lexi was under the 3rd percentile for weight AND height. I promised the doctor that I WAS feeding her, and he wasn't worried. She's just a tiny one, which I love. It's so cute how tiny she is, but how chubby her cheeks are! (I'll be interested to see how her 12 month appointment goes, because it seems like she's grown a lot lately). She's lost her fascination with the camera, so it's harder to get her to smile at the camera like she used to. But, sometimes the candid shots are cuter anyway. At nine months, Lexi had officially said her first word (dada - she said it on Mother's Day). 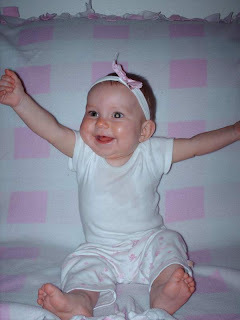 She began rocking back and forth while on her bum, and she'd scoot herself in a circle on the floor. She loved practicing her sounds like "tuh tuh," or "th th th" or "yuh yuh." In June, she learned to crawl. It started out as a tummy/army crawl. She'd get down on her belly, and use her feet to scoot forward a few inches at a time. 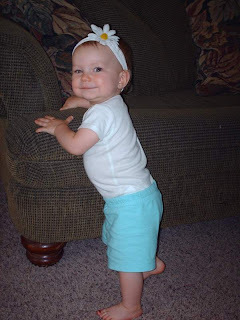 Then, she learned to crawl using one knee and one foot, which is how she still does it. 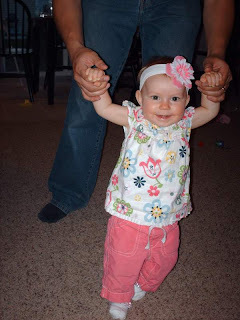 Even knowing how to crawl, her favorite thing was walking around using daddy's hands. He'd go really quick around the room, and she'd pump her legs as fast as they could go, round and round the room. Now, Lexi is 11 months. I can't believe we have just less than three weeks until she hits her 1st birthday! Lexi is an expert at cruising furniture. She pulls herself up really well now, and can almost go anywhere. She's also amazing at staircases now. Wherever we go, she looks for the stairs. She goes up, and then claps for herself when she gets to the top. I thought it'd take her a while to learn, because for two days straight, she only crawled up one step. But, then, one day, she just decided to go up the whole flight!!! So, we now have to take the gate with us when we're downstairs, so we can keep her down there, and not go up and down all day long. (she doesn't know how to go down yet, so I still need to follow her up). She cut her top two teeth a couple of weeks ago, so now she has 4 teeth. Two top and two bottom. If I can get her to smile really big, I'll post a picture of that. She loves adult food. Now we feed her anything we can. (Still minimal milk, and no citrus, PB or honey or eggs). But, she loves mommy and daddy food. She begs every time we're eating. So, for dinner every night, she tries whatever we're eating, and if she doesn't like it, then I just give her homemade veggie or fruit baby food, or finger foods. But, we're slowly transitioning to the table food thing, and it's so fun!!! Thanks everyone for all your stellar advice and help with the nap-standing issue. It's still a problem, but it seems to be getting better. I'm doing better at not going into her room. And I KNOW she's not stuck anymore. She can get down on her own. It also helps if I make sure she's well fed before she naps. That way, I don't sit and wonder if she's crying 'cause she's hungry. As long as I know she's not hungry or messy, then I let her just cry, cause I know she's tired. So, thanks for the help. It's been way too long since I posted pictures and updates. We have had a busy summer, and I have several things to write about. So, I'll get on that pronto!! !